Travel info, diary, and travel links from all over the world..
Addicted to this game! Hero`s Arm`s! Wow! I have been totally addicted to this Zelda like game lately, recommend you check it out.. IT`s free! Living the life on Isla Mujeres, thats what! Although the life is somewhat a little dull right now, as my girlfriend has been gone for more than 3 months now, and will return on the fourth.. That means she`ll be here soon! Good for me, eh!? Well what do I do all the time here on Isla Mujeres you ask? My daily routines are somewhat flimsy, but randomly I wake up 9 or 10 in the morning.. get some breakfast, take a walk along the beaches on the Carribbean side of Isla to see what new treasures there are too be found.. It`s always something new showing up, from crazy fish, half eaten by some kind of seamonster, beautiful shells, driftwood and other trinkets.. This really is an amazing place to find beautiful free stuff! Now what I try to do during my walks is try to find out some kind of new idea for a product that I could use for my business.. I always have some kind of crazy ideas, but rarely ever make anything out of them.. I want to take it a step further, and really try to come up with something creative and brilliant that people would be interested in.. I have a few projects going already, but since I have been told to not share to much, I can`t even tell you about them.. When I`m not out and about going crazy, I have found this brilliant place for snorkelling just outside Avalon Hotel, and keep going back there.. So far I`ve seen stingrays, moray eels, thousands of fish in enourmous schools, beautiful coral fishes and much more.. Always looking for some treasure though.. You never know if there is any gold left somewhere after the pirate Mundaca that used to live here.. Speaking of which, I want a metal detector! I really think I could find some valuables on this island paradise! Other than that, I am as always, my geeky self.. I love spending time in front of my computer, and get a lot of hassle for doing it.. But right now my only contact with my friends and family back in Norway is through the net, and as Isla can be very quiet sometimes it`s always good to hear news..
Oh.. And did I tell you I have an art gallery here now? Oh yeah.. The bartending school did unfortunately not fall through at the moment, but we found inspiration through my creative and artistic mother helping us out to set up our gallery! 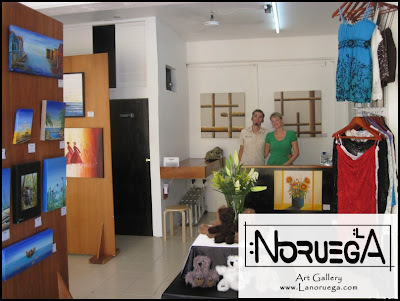 It`s going well and we are now proud owners of our very own art gallery on Isla Mujeres! If you are ever on this island paradise, please come check us out, we have a wide collection of art from around the world! Curious about something else? Ask some quiestions, I don`t think there are that many actually following my updates, would be cool to get some feedback once in a while..
Before returning to Isla Mujeres, I thought it would be a great idea to grow a goatee! Photo to the left: "Hulk Goatee" and right: the "Fidel look"
"The famous Goatee in a rubber band look"
And here is the little bugger... 3 months of growth, all cut off because me and my girlfriend do not enjoy hair in our mouths when we make out.. It`s a hard life, eh? Can you grow more than me in 3 months? Almost six cm, or 2,2 inches! The Avalon Reef Club Isla Mujeres is a luxury-class hotel located 41 kilometers from Cancun International Airport. This beautiful property is a great hotel that offers its guests plenty of reasons to stay there. The hotel is close to several sights worth checking out during their visit. In addition, an array of awesome amenities await guests when they check in, helping to make each stay more enjoyable and pleasurable. The number of facilities, features and services is seemingly endless. It is the ideal choice when staying in this vibrant city. When it comes to the hotel's accommodations, guests will find everything they want and need. With tastefully appointed guest rooms that are well stocked with the modern amenities travelers expect today, the hotel goes a long way to make sure everyone enjoys their stay. Adding to the overall pleasure of a stay here is the attentive and personable staff. Always professional, the knowledgeable staff is on call for every guest's needs and requests. The hotel is close to area dining, entertainment and shopping venues. Exclusivity is guaranteed with eight originally decorated rooms all with an ocean view terrace, plus a dream Villa with an atmosphere designed to heighten the senses and promote total well-being. Wake up to tranquility and discover the flavors of nature, comfortable luxury, Mexican hospitality, and Mayan culture. To ensure the peaceful environment televisions, telephones, alarm clocks and the visits of children under age of 21 are not part of our services. This will allow you to be as close as possible to the beauty and sounds of nature. The Hotel Was Built in 1980 and Comprises a Total of 9 Guest Rooms. The Hotel Offers a Holistic Place in Which To Relax and Recharge Body, Mind and Soul. It is Situated Right On the Shores of the Caribbean Sea, and Provides Guests With Terraces With Both Sun and Shade, from Which They Can Enjoy the Beauty of the Natural Surroundings. Facilities On Offer Include Wlan Internet Access, a Children'S Playground and Parking For Those Arriving by Car. Surrounded by turquoise waters, the Cristalmar Resort & Beach Club offers secluded tranquility, yet is close enough to explore the mainland, historic sites and Cancun nightlife. Located on the quiet south coast of Isla Mujeres 3 miles from downtown pier, the resort offers a diver shop, game room, pool, restuarant, mopeds, bicycles, golf carts, diving, fishing and land excursions. The 1 and 2 bedroom units has kitchenette, dining room, hot & cold water. Positioned one-half kilometer from downtown Isla Mujeres in Mexico, the beachfront Ixchel Beach Hotel stands less than eight kilometers from the Ixchel Ruins. Garaffon National Park is located six kilometers away. The Sunset Grill is a beachfront palapa that features buffet and a la carte service for breakfast, snacks and Mexican seafood for lunch and gourmet and international specialties for dinner. The Kalak snack bar prepares buffet-style breakfasts and offers poolside service. Wireless Internet access is available in public areas of the hotel. Property conveniences include laundry facilities, concierge services and a 24-hour front desk. An outdoor pool and beach frontage offer seaside recreation, and massage services are available upon request. This hotel features 48 air-conditioned guestrooms, and one- and two-bedroom suites. Accommodations reflect the colors of the beach and boast garden and/or ocean views. All rooms feature satellite television, CD and DVD players, safe-deposit boxes and marble bathrooms with showers, only. Suites include balconies or terraces, separate master bedrooms, dining and living areas. Kitchenettes contain refrigerators, coffeemakers, toasters, microwave ovens and bottled water. Select suites feature jetted tubs. Penthouse accommodations connect to bedroom suites via spiral stairways and include roof gardens. Placed in the heart of Isla Mujeres and offering comfortable accommodation, this property is a new jewel that combines the taste of Mexico with all modern conveniences for a memorable stay. Located on the famous Ave Hidalgo, the Suites Los Arcos is in center of the shopping and dinning district of the beautiful island of Isla Mujeres. The hotel offers completely equipped suites that come with a well equipped kitchenette as well. There is no restaurant available on-site. During leisure, you can visit the various attractions of the city. Na Balam is a refuge for the soul in the Mexican Caribbean on Isla Mujeres, a small island only 20 minutes from Cancun. It is a site chosen by nature to enjoy every sunrise in México. The Na Balam Hotel is located on the most magnificent beach in the Mexican Caribbean with tropical gardens and hammocks under beautiful palm trees. The hotels 28 rooms are all surrounded by tropical gardens and come with a king size or two queen beds, a private terrace or balcony, air conditioning and ceiling fans and in-room safety deposit boxes and 24 hours security protection. The 3 magnificent suites feature a king sized bed, Mayan-Modern decoration, air-conditioning, ceiling fans, a private patio and a small pool with hydro-massage with a stunning view of the inlet; ideal for honeymooners or anyone wishing a romantic and/or peaceful stay in a beautiful place. An earthly wonder of sand and sea meet at Nautibeach Condos nestled on the north end beach of Isla Mujeres, Mexico. Your own balcony compliments your beautiful two bedroom condo and together offer a space for recharging your spirit, watching masterpiece sunsets, planning your next day, or doing nothing. Nautibeach Condos offers the perfect island retreat, with an emphasis on superior and friendly personal service. Experience the barefoot elegance of Nautibeach Condos. Small and luxurious, located on the beautiful and charming island of Isla Mujeres, on a powdery-white sand beach, this resort is sure to guarantee a private and relaxed stay. Guests can lounge around the free form pool or on the tranquil beach or for a bit of the local custom, they can enjoy the nice breeze lying on one of hammocks strung amongst the palm frees. This all-inclusive resort features 62 Superior Deluxe accommodations all with a double Jacuzzi, balcony and 24-hour room service. A variety of international favorites offer a la carte breakfast and dinner. And don't miss the ample lunch buffet in the open-air restaurant by the sand where you can enjoy the Caribbean breeze. The Hotel Perla Del Caribe is situated on the beach in the heart of Isla Mujeres, approximately 30 minutes by boat to Cancun. Hotel amenities include babysitting, restaurant, bar, outdoor pool, and two sundecks. Guest rooms feature fully tiled bathrooms, hot and cold running water, A/C (most rooms), telephones, and balconies. The Pocna Hostel is located on Isla Mujeres. It is only 6 blocks from the pier and even closer to the beach. The hotel offers beds in mixed dormitories and private rooms. There is also camping available for guests with tents. There is a game room, meeting area, restaurant/bar, beach bar, pool, beach volleyball, internet, cable television, table tennis and wireless internet access. Very popular with backpackers, and the beach bar at night is worth a look if you like to party! Featuring 124 luxury units, brand new modern facilities for those travelers looking for an excellence privileged surrounding. The five scaled floor Privilege Aluxes Isla Mujeres hotel buildings are in front of Playa Norte, considered one of the best beaches in the area which is suntan perfect under the breeze of the coconut trees, to savor typical, fresh and gourmet dishes. Spectacular sunsets to admire are an everyday experience to guests, visitors and locals. The north end of the 4.6 miles long island is ideal to swim and relax just a few steps from the hotel. Due to the excellent conditions it is one of the perfect places for aquatic activities. ALL INCLUSIVE Gourmet, by PRIVILEGE HOTELS, two outdoor swimming pools, room service 24 hrs Three Gourmet Restaurants, Pool Bar: Lunch ? Snack, Bartender & waiter service at Solarium, Pools & Beach, Minibar in every room (refilled daily, water, juices, soft drinks, beers and snacks), Coffee service in the rooms: daily replacement, Safety deposit boxes, Fitness & hotel facilities & beach. Spread over five floors, this professionally managed luxury resort offers tasteful amenities to discriminating travelers. The Sandcastle at Birch Bay has condominium units, guest amenity areas, retail space and the attention to detail of a first class hotel. Our two-bedroom condominiums average 1050 square feet, and the three bedroom residences averaging 1280 square feet. Each unit is professionally decorated and furnished and includes washer/dryers, balconies and dual line phones. Every unit has a view. The on-site restaurant, provides room service and convenient food service. Guests have access to a ground floor health club with male and female locker rooms and a fully equipped workout room. The on site day spa is available for massage or facials as well as a number of other relaxing treatments. Secreto Is An Oasis Of Casual Luxury Within The Small Fisherman S Village Of Isla Mujeres. Situated On A Secluded Cove And Surrounded By Palm Trees, This Small Hotel Feels Like Your Own Private Beach House. Discreet And Secretive - Just As The Name Implies. Not Even An Entrance Sign Notifies You Of Its Existence Underscoring Secreto S Very Essence. Your Room Exudes Warmth And Intimacy, Whether You Re Relaxing Under The Veils Of Secreto S Four-post Beds Or Enjoying A Cocktail On Your Terrace. At Night, Open Your Terrace Doors, And Let The Tropical Breeze Whisk You To Sleep. Every Room Offers Superb Ocean Views, And Features The Very Best In Amenities, Including Your Own Cd Sound System. During The Day, Cool Tropical Winds Refresh Those Passing The Day Away From The Comfort Of A Deep, Outside Living Room Sofa. Panoramic Ocean Views Create The Perfect Back-drop For Enjoying Breakfast Or Getting A Massage. With Its Handsome Architecture And Mediterranean Sensuality. Secreto Is The Perfect Setting For A Blissful Vacation At The Beach. The hotel stands 14 kilometers north of Cancun and transports guests via yacht from its Cancun VIP Lounge to Isla Mujeres. Guests are greeted with chilled champagne and cool towels. Rejuvenation continues at The Spa, presenting a menu of Mayan-inspired services such as indigenous steam bath sessions. The Spa's fitness area features an assortment of cardiovascular and weight-training equipment and stocks chilled towels. The Spa's Garden Studio sets the scene for yoga, Pilates and tai chi sessions. Outdoor activities include island tours on golf carts and kayaking adventures in Caribbean waters. Unik offers several dining options. Pearl restaurant pairs fresh seafood and pasta with wine selections by the hotel's resident sommelier. Jade restaurant fuses Asian and Mexican flavors to create a unique gourmet menu. The poolside Breeze restaurant utilizes fresh seasonal produce and seafood from local farmers and fishermen. Additionally, La Isla diner provides poolside lunch service while Aqua pool bar mixes specialty tropical cocktails. Guestrooms at Unik feature flat-screen televisions with DVD/CD players. Cable television is provided. A bedding menu offers a selection of pillows and linens. Feather duvets top the beds. Room services include butler service and nightly aromatherapy turn-down service. Select suites open to ocean-view terraces with spa tubs and outdoor living areas. Bathrooms supply bathrobes, slippers, designer toiletries and woven cotton towels. Select bathrooms feature spa tubs and marble-top vanities with double sinks. Near the resort, the vestiges of an ancient temple preserve the story of Ixchel, Mayan goddess of the moon and fertility. This luxury resort lies between the white-sand beach and the Makax Lagoon. The ferry terminal is located a short distance away. Dolphin Discovery, where these extraordinary mammals greet visitors with a handshake and a kiss on the cheek, is located one kilometer from this property. This resort delivers complimentary continental breakfasts to its guests, daily. An extensive bar accompanies the Restaurant Casa Rolandi Isla Mujeres which is known for its signature Swiss-Northern Italian cuisine. Complimentary Internet access and fax and photocopy services are available 24 hours a day. Constructed in modern Mexican-Mediterranean style, the hotel features Tikul stone floors and tiled vault ceilings that are built to absorb sound. An outdoor pool features a cascading waterfall, where the atmosphere is ideal for sunbathing and sipping cocktails. The front desk staff can arrange tours, fishing excursions, scuba-diving expeditions and boat rentals. Resort amenities include on-site laundry facilities, massage by appointment, and room service. The hotel also offers discounted passes to a nearby fitness center. Villa Rolandi offers 35 air-conditioned, ocean-front Junior Suites with fully stocked refreshment cabinets, digital-lock safes, and cable television. Private bathrooms are tiled in marble and feature showers, separate vanity areas, terry bathrobes and slippers. Private balconies feature uniquely designed spa tubs. Inviting detail lends warmth to the suites' individualized layouts that feature rich, custom-crafted wood furnishings. Artworks and design accents, such as wrought-iron railings, vibrant fabrics and marble-topped counters, reflect this region's colorful Mexican heritage. These are some of the most popular hotels, I found a couple more, but little information about them, if you need any help please mail us, and we`ll do our best to get your hotel here.. I am currently working hard on promoting Isla Mujeres with it`s own blog on http://islalife.blogspot.com , and it`s turning out great! This is why there has been few posts lately! Keep checking back, as updates will come.. If you are interested in writing for IslaLife, please contact us! Are you man enough to grow a goatee? Whoa! Thats a lot of pictures! Whats up on Isla Mujeres?! To earn enough money so I can live on Isla Mujeres, and travel the world from here! And the plans are already on their way! I am starting a Bartending/Language School on Isla Mujeres in Mexico! Norway, Denmark, Germany, France, Italy, Sweden, United Kingdom, Greece, Switzerland, Netherland, Belgium, Luxembourg, Spain, Portugal, Cyprus, Thailand, Egypt, Morocco, Austria, Cuba, Jamaica and more to come!